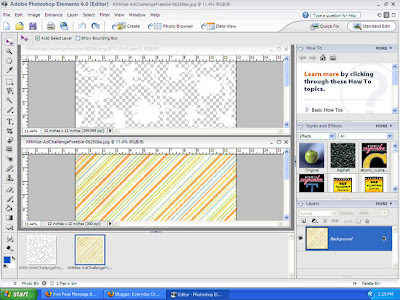 Weekday Tutorials featuring Computer Tricks for Scrapbooking. Welcome digital, hybrid, and traditional scrappers! Content is no longer provided daily however we have a large archive that you are welcome to browse. Visit the archive on our home page or in the sidebar. 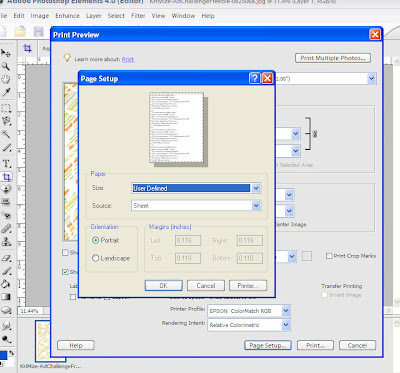 What do you do when you want to create a 12x12 layout using digital products however you do not have a large format printer? I will show you how to print and use digital paper for use in scrapbooking. You will need white paper that is 12x12. It can be white on both sides or you can print on the white side of printed paper. The paper and overlay I am using was downloaded from Designer Digitals. 1. Open the paper of your choice from a digital kit. Here I have also opened a digital overlay or transparency. 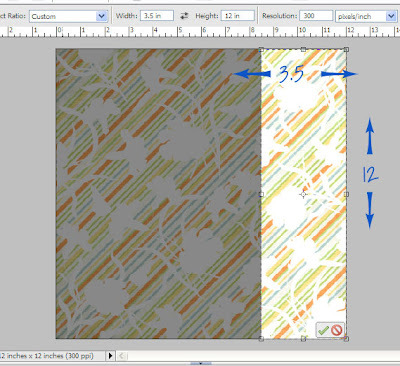 I will drag the overlay onto the striped paper to create a customized look. 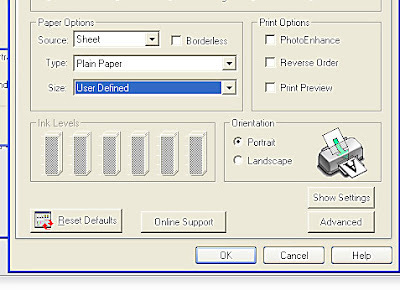 Take the actual paper that you will be printing on and crop it to 8.5x12 inches with your trimmer. Bring both this piece and the left over piece that is 3.5x12 inches to your printer. 4. 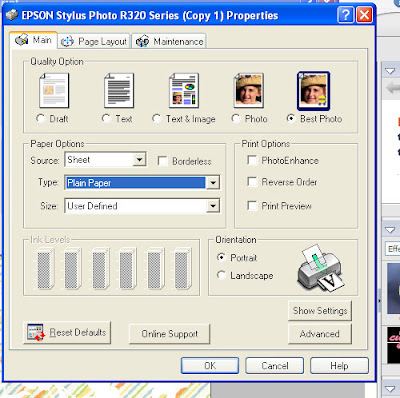 Set the crop tool for 8.5 inches x 12 inches, resolution 300. 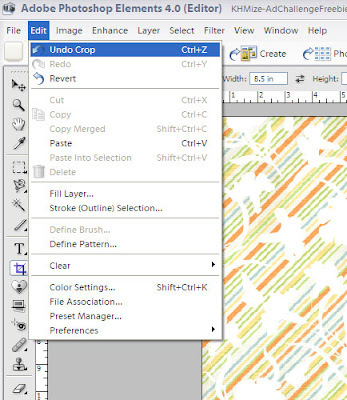 Drag the crop tool from the upper left corner to the bottom. Click on the check mark to crop. 5. Click on File --> Print. In the preview window, click on Page Setup. With the "Size" drop-down menu, choose "User-Defined." Click ok.
6. Click PRINT. If you get a pop-up that says that some clipping will occur, click ok.
7. Click on Properties in the dialog box. 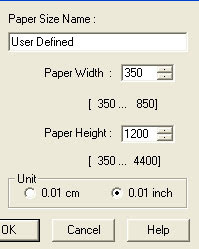 In the Paper Options field, click on the drop-down menu for size and choose here "User-Defined" and you will get a box that alllows you to put in the dimensions. Type 850 for width and 1200 for height. Click OK.
8. Set Quality for Best Photo. 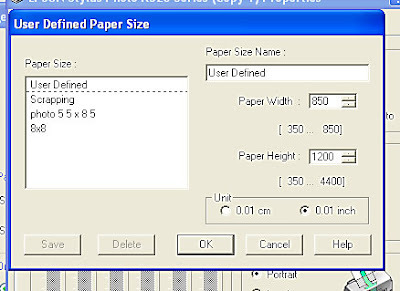 Select the Paper Type. My paper is not cardstock so I chose "plain paper." Click ok to print. 10. Now we will crop for the left-over piece of paper. 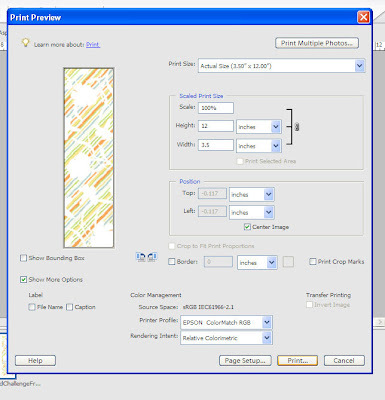 Set the crop tool at width: 3.5 inches and height: 12 inches, resolution 300 pixels/inch. Click the check mark to crop. 11. Repeat Steps Five and Six. 12. Repeat Step Seven except now we will enter 350 and 1200 as the values for the size of the paper. 13. Repeat Step Eight. Now you have your own customized paper to create a hybrid layout, and if you printed on the back of printed paper you now have awesome two-sided paper! Have fun! Since my printer does not print all the way to the edges, I will just plan my design to have a cardstock base with these new printed papers. If you like this tutorial, please leave a comment. Enjoy your new digital knowledge! Wow - very cool! I would have never figured that out! Great tut - thanks! will be trying this out! thank you for explaining this step-by-step, julie! i really appreciate it. sometimes the girls don't explain how to get from point A to point B very well; they assume everyone knows, and it's very frustrating. so thank you for taking the time (and the screen shots!) to help us follow along! Elizabeth, if you only have a regular size printer, this is the only way to print 12" x 12". Yes, you will end up with 2 pieces of paper, but you can cover the seam with paper, ribbon, or other embellishments of your choice. 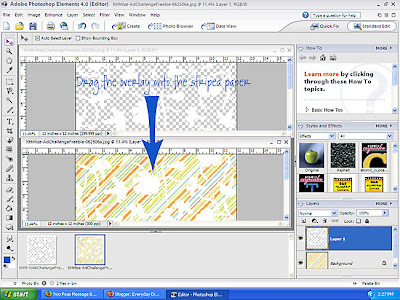 The Everyday Digital Scrapbooking Idea Blog's mission is to bring new ideas for scrapbooking with your computer via tutorials every weekday. This mission is accomplished through step-by-step instructions, visual examples of layouts, and links for related information for all ages. 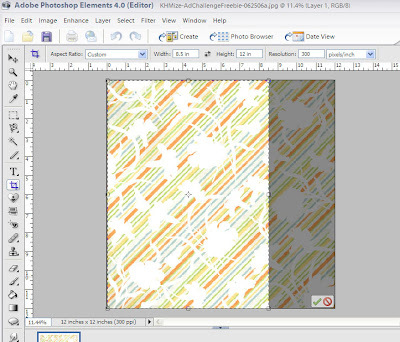 This blog is a multi-designer blog devoted to digital technology for use in scrapbooking. Its purpose is to inspire creativity by sharing links and resources. Inspiration for Generation C is my blog to share my scrapbooking and creative ideas and tips. (Generation C = Creative Crafty Content) Please subscribe and visit often! Everyday Digital Scrapbooking 2006-2007| No part of the content or the blog may be reproduced without prior written permission.